Community eyes and ears are needed to protect the region’s prized coastline from vandalism and destruction. Council’s Vegetation Management Coordinator Lyall Bogie said the illegal clearing of vegetation had the potential to undermine ecosystems, cause erosion and strip the area of natural beauty. “From time to time we investigate reports of trees being cut down or poisoned and understory growth cleared to improve views and real estate values,” Mr Bogie said. “We have had a spike in reports of late, with a special focus on Wallaga Lake, Tura, Merimbula and Pambula Beach,” he said. Penalties including fines and court appearances are all possible for people found guilty. “We really don’t want it to get to that, but the importance of these areas can’t be under estimated,” Mr Bogie said. “The trees and shrubs that grow along our coastline play an important role in the environment in terms of providing habitat and food, and limiting the sediment that runs into local waters ways and eventually on to beaches and into the ocean. “They are also home to rare and threatened animals including pigmy possums, potoroos and yellow bellied gliders, all of which rely on intact forest habitats for survival,” Mr Bogie said. There are provisions that allow for clearing around homes and public assets for bushfire protection and Council can advise residents of the options available to them. “The ocean and this vegetation go hand in hand, I understand people’s desire to improve their view, but in the long run people are jeopardising the very environment they love and live in,” Mr Bogie said. 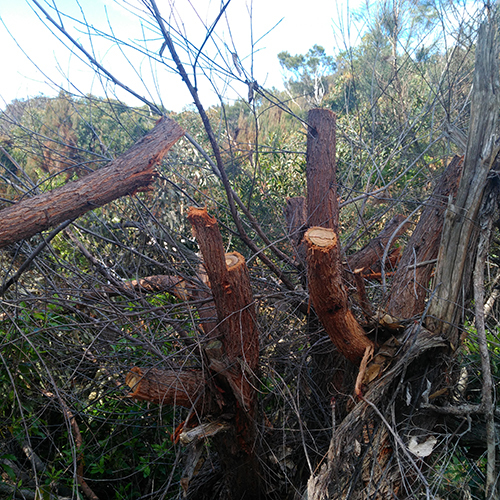 Residents are encouraged to report any suspected vandalism and illegal clearing to Council’s Vegetation Management Coordinator Lyall Bogie Team on 6499 2222. Council’s first response will always be one of education and monitoring before any formal legal proceedings.